April 28, 1923 – Feb. 2, 2019 Marjorie F. Wideman of Akron, New York passed away peacefully surrounded by family on February 2, 2019 in the Palliative Care Unit of Brothers of Mercy Skilled Nursing Facility, where she had been a resident for a short time. Marjorie was born April 28, 1923 in Indian Falls, NY. She was the daughter of the late Joni and Mabel Yoder. She was the loving wife of the late Leon J. Wideman and beloved mother of the late Mary Lou (Jeffrey) Regan, John ( Mary), James (Kathy) and Robert (Linda). Cherished grandmother of Gregory (Jenn) Regan, Katherine (William) Murray, Emily (Jason) Brosius, Bonnie Mae Wideman, Benjamin( Christina) Wideman, Samuel (Alicia) Wideman, Joshua ( Laura) Wideman, Elizabeth and Seth (Rachel) Wideman. Adored Great Grandmother to Misty, Cooper, Hudson, Liam, Collin and McKenna. Marjorie was a graduate of Parker High School in Clarence, NY, class of 1940. She continued her education at Goshen College where she received her Bachelor’s degree in Home Economics. From 1948 to 1950 she served as a relief worker in Germany with the Mennonite Central Committee. Her duties were to provide food and clothing to the refugees in Germany after World War II. In 1970 she went on to receive a Master’s degree in Education at Buffalo State College while raising her four children on the family dairy farm on Hunts Corners Road in Akron. She was a retired Home Economics teacher at Akron Central School. 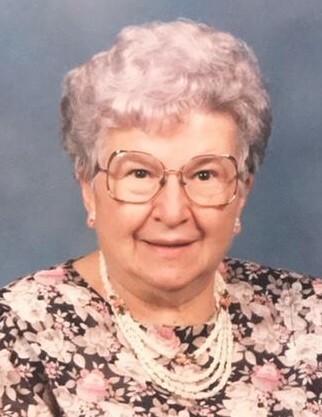 A devout Christian, she was a charter member of the Clarence Center-Akron Mennonite church where she served as Historian and Sunday school teacher. A member of International Students Inc., she hosted numerous students in her home from all over the world. Friends and relatives may call from 3 to 8 pm on Friday February 15, 2019 at Ross Funeral Home of Akron, LLC 10 Eckerson Avenue Akron, NY. A Memorial Service will take place at the Clarence Center-Akron Mennonite Church on Saturday February 16, 2019 at 11:00am. In lieu of flowers, donations may be made to the Newstead Fire Company or International Students Inc. (Buffalo Unit) Colorado Springs, CO 80901-3000.